Linda Jardine of Children 1st and Insp Chris Boath at the launch of the Trauma Teddies. A new project launched by Tayside Police Division is not only bringing comfort to children who need it most but also knitting communities together. The brainchild of local community constable Andrew Kerr, Trauma Teddies are brightly-coloured knitted teddy bears for youngsters who have been caught up in some kind of disaster or tragedy to bring them comfort at a time when they need it most. The idea of Trauma Teddies originated in Australia where firefighters gave children teddy bears as they fled the bush fires that had destroyed all of their belongings, and now several police forces across the UK have adopted the concept. 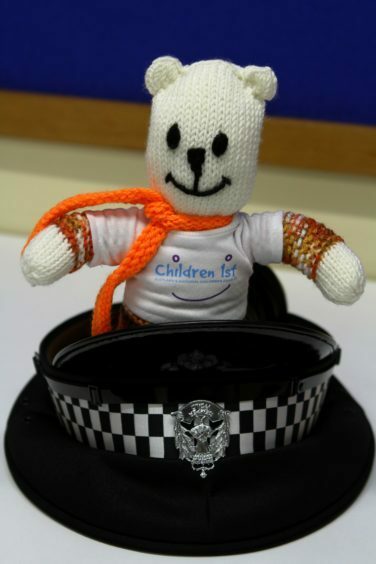 Thanks to a massive response from kind-hearted folk from as far afield as Texas, the teddies are now being carried in all marked police cars in Dundee and given to small children who come into contact with the police through traumatic or upsetting circumstances. “I saw a Facebook post on the Northumbria police website and how they use the teddies to comfort children when they might be struggling to find other ways to do so,” explains PC Kerr, who recently took part in Kaye Adams’ radio show to highlight the campaign. “I brought the idea forward to Tayside Police Division and once we’d got permission from Northumbria, we were able to post the pattern for the teddies on our Facebook page,” he says. PC Kerr cites road traffic accidents and domestic-related incidents as two likely scenarios where children would benefit from a hug from a Trauma Teddy. “Being involved in a road traffic accident is naturally very distressing for a child,” he says. “The first thing we’re thinking of is evidence and sometimes we forget the children in the background. But the teddies will help comfort them and also enable us to help. “The children get to keep the teddies – they’re something they can hold on to for comfort and help them cope because we can’t be there 24/7,” he continues. “When a domestic-related incidents are concerned, we often go to houses where youngsters are upset and crying. “It’s not just about us stomping in and out – the teddies can make a huge difference going forward by accentuating the positives rather than the negatives. The response has been over-whelming, with individuals and community groups all over the UK and even as far as Texas volunteering to knit a teddy. “We are so thankful for the generosity the appeal has received,” says PC Kerr. 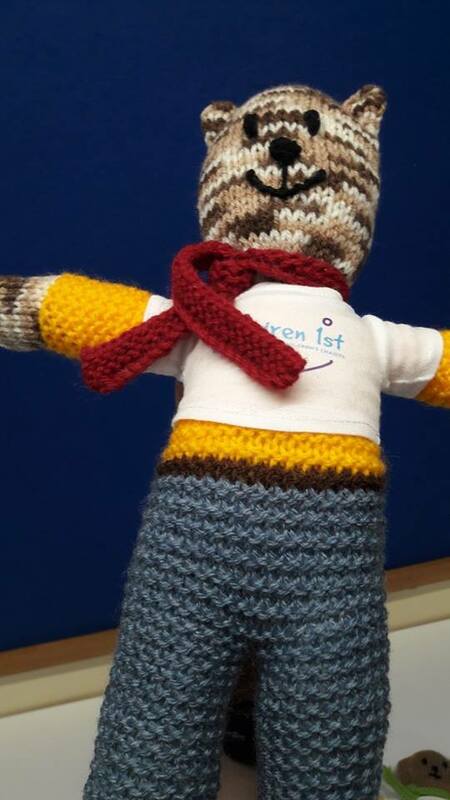 “We were aiming for a 100 or so teddies at the beginning but we’ve received around 500 – the project has really grown arms and legs, just like the teddies! “We’re working in conjunction with Children 1st who will be donating T-shirts and labels, and we’re also working with Duncan of Jordanstone to create colouring books to eventually hand out to children with the teddies,” he continues. One Dundee community group that has embraced the appeal is Link Up Whitfield – and it’s not the first time they’ve picked up the knitting needles for a good cause. Gill Bain, manager for Link Up Whitfield, explains: “We have previously helped with The Innocent Big Knit and our volunteers and members of our arts and crafts group really enjoyed doing this to help other people. One volunteer, mum-of-three Suzanne Whelby, knows from personal experience just how valuable a Trauma Teddy could be. “When my eldest was three we went through a traumatic time and it would have been good if she had been given a teddy then to give her a bit of comfort,” she reflects. “The teddy is something they can connect with, something to divert them from the trauma and something nice to keep. Stuffing – please only stuff teddy with polyester or other healthy padding. Continue in garter stitch for 30 rows in trouser colour. Make another leg in the same way. Knit across all 20 stitches and work 16 rows. Change to jumper colour and knit 24 rows. Change to main colour for head and also change to stocking 5½ inches. Continue remainder of Teddy in reverse order. Stitch down the sides of the head. With jumper colour, pick up 8 stitches either side of the neck join (16 in all) and knit 20 rows. Change to main colour and knit 10 rows for paws. Sew up Teddy leaving opening in crotch. Turn right side out and sew diagonal top corners for ears before stuffing. After stuffing, run a thread through the knitting around the neck to draw it in. Sew a happy face and for mouth use either stem stitch or back stitch. Scarf: Cast on 75 stitches. Knit 4 rows and cast off. Tie scarf on Teddy the back of the neck, close to the jumper edge. Don’t sew down at the front. Well done – you have just brought a smile to a child’s face! The completed Teddies can be handed in to any police station or to Children 1st in Blinshall Street, Dundee.